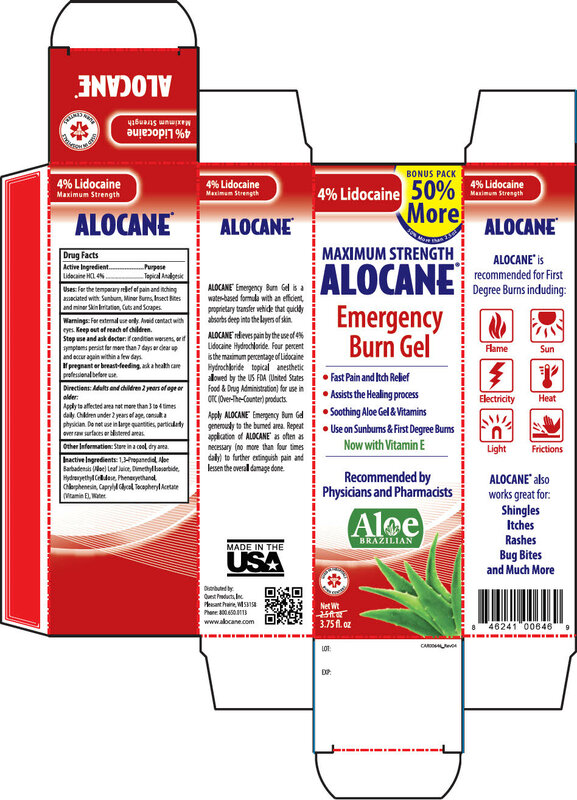 Proprietary Name: Alocane What is the Proprietary Name? 68229 - Quest Products, Llc. Alocane with NDC 68229-201 is a a human over the counter drug product labeled by Quest Products, Llc.. The generic name of Alocane is lidocaine hydrochloride. The product's dosage form is ointment and is administered via topical form. Labeler Name: Quest Products, Llc. For the temporary relief of pain and itching associated with: Sunburn, Minor Burn, Insect Bites and Minor Skin Irritation, Cuts and Scrapes. Stop use and ask doctor: if condition worsens, or if symptoms persist for more than 7 days or clear up and occur again within a few days. Apply to affected area no more than 3 to 4 times daily. Children under 2 years of age, consult a physician. Do not use in large quantities, particularly over raw surfaces or blistered areas. 1,3-Propanediol, Aloe Barbadensis (Aloe) Leaf Juice, Dimethyl Isosorbide, Hydroxyethyl Cellulose, Phenoxyethanol, Chlorphenesin, Caprylyl Glycol, Tocopheryl Acetate (Vitamin E), Water.